We would like to thank all of the schools in the Pelham area as well as the Welland French Schools that sent students to our Effective Speaking contest on February 25. Thanks to all the contestants, your speeches were informative and entertaining. In our eyes you were all winners. To all the parents thank you for encouraging your children to take part in a dying art. Speaking in public will be so important to them as they go through life. To the judges who took time out of their busy lives to judge the speeches. Thank you for making it a successful afternoon. Meet the happy winners of the Fabulous Fenwick Lions Club; Fenwick Lioness Fonthill Lions Club; Fonthill Lioness Effective Speaking Contest held yesterday at the Fonthill Legion. Junior 3rd Place Ayla, Junior 2nd Place Tyler, French Intermediate 2nd Place Annie, Junior 1st Place Isaac, French Intermediate 1st Place Rodie, English Intermediate 1st Place Anderson, English Intermediate 2nd Place Natalie, English Intermediate 3rd Place Laura. 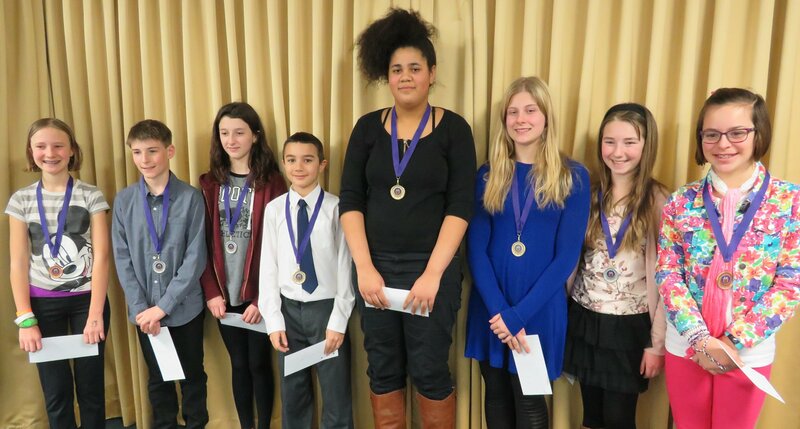 Each year the Fenwick and Fonthill Lions and Lioness sponsor a public speaking contest for local students in grades 6 through 12 in both English and French. The winners now advance to the District level competition.